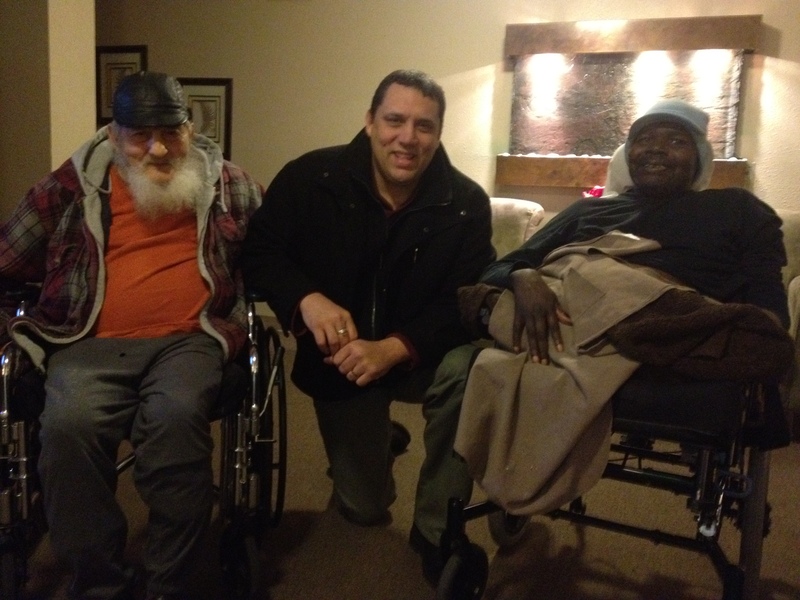 Left to Right: Ralf Perry-WWII veteran, Sean Davis-Iraqi War veteran, Charles Williams-Vietnam War veteran. The messages from friends and family start every year on Veteran’s Day and continue into the new year. They thank me for my service and they are grateful for what I went through to help defend our country. You see, I was critically injured in an ambush in Taji, Iraq back in 2004. My good friend Eric McKinley was killed in the same ambush. I had some serious issues to work through for the first couple years after I came back and they’re proud I worked through them. Their kind words and support means the world to me and I’ve started to notice the longer I’ve been away from that period in my life the more it means to me. Throughout the years many of my friends and family ask what they can do to support the troops, not the wars, but the troops who fight in them, especially during the holiday season. This made me think about myself and what I could do to help other veterans. A few years back I volunteered at a veterans outreach and out-patient center for PTSD. During this time I found that many of the veterans from the current wars came in for help but there were many veterans from the previous wars coming in for the first time as well. I remember when my unit came back from our tour in Iraq. It was Saint Patrick’s Day, 2005. I had come back months before after being wounded so I was part of the giant crowd at Fort Lewis. Small American Flags waved on sticks in children’s hands, large flags hung off the back of motorcycles and trucks, giant flags hung off every building. I couldn’t hear anything but the cheers from the people around me and every face had a smile of pride. Many people held back tears. I have no problem admitting that I was one of the ones who let them flow. My unit marched off the plane straight into a big hanger with bleachers filled with family members, friends, and veterans from other wars. The band played and cadence was called until each platoon was called to attention and the speeches of grateful command, grateful political leaders, and a grateful country were given. Recently I heard another homecoming story. A little over forty years ago, in the winter of 1971, a soldier flew into Oakland Army Base fresh off his tour from Vietnam. This soldier came back to an empty terminal under a gray sky. He was in uniform carrying his A bag and the people at his homecoming hated that ongoing war, hated the government, and as an extension they hated him. Charles Williams tells me that when he walked into the civilian world he was spat on and called horrible names for events he had no control over. A childhood friend came to pick him up in a Cadillac. He threw his A bag in the trunk and they started the two hour trip back to Fresno without knowing what the hell to say to each other. When Charles talks about his time in combat his eyes dart around the room and his voice is soft. “They used to call me Sergeant Boomerang,” he says, “because I always came back.” He tells me he climbed trees on patrol, that was his secret. He pauses, his eyes relax like he isn’t seeing the inside of the room we sit in, and he motions with his hand like he’s showing me, “then I would just smoke anything coming down the path.” Charles says the terror was in not knowing what was five-feet ahead of you because the jungle was so dense. John Wittlake was a combat medic in the Korean War, landing in country only a couple months before the truce was signed. He says he only saw a month or so of combat but that was enough. When he came back to the small town of Kalispell, Montana, his whole church turned out. He had a hero’s welcome but during that first years his emotions were all over the place and he had rage issues. “I still don’t forgive myself for how I treated my mother during those times,” He tells me. Ralf Perry tried to join the army at sixteen to fight in the Second World War. They wouldn’t take him until he was seventeen and then only with a note from his mother. His very first day in the army he had a pin up girl covered by an American Flag tattooed on his arm. He fought the Axis in Italy and after the war his duty station was at a POW camp filled with Germans. I wasn’t surprised to hear that when he came back he had problems too. My point is that a soldier is a soldier no matter the war, and while most of us have come back with issues to work through not all of us came back to such a sympathetic nation. Today ‘support our troops’ has become a social mantra and I know every Iraq and Afghanistan Veteran appreciates this deeply but we are only the newest members of this group. I ask that during this holiday season if you would like to do something to support the troops, make an effort to thank all the veterans. Talk to your grandparents, your parents, your aunts and uncles, and let them know you appreciate their service too. The men in this article all live at an assisted living center in my neighborhood where I sometimes volunteer. Reach out and find a place like it in your neighborhood. Bake some cookies, read to, or just speak to some veterans who might not have a lot of friends or family available to visit them. There are many of the Iraq and Afghanistan War veterans who need help, but there are also many more veterans from previous wars who need help as well and while they are entitled to just as much of your respect and support they don’t have the focus on them. Charles Williams is a double amputee now and a stroke took the use of his left arm. He was flown to Portland from his family in Las Vegas because the VA wanted to give him the best treatment possible, but his family doesn’t have the money to come out to visit. John Wittlake lost 98% of his hearing in a training accident and needs the VA’s help as well. Ralf Perry is in his mid 80s. He is funny as he is stubborn but has problems with taking care of himself and doesn’t have many family members who visit. Like I said the more time that gets between me and that period in my life the more I appreciate my friends and family’s support. Well, imagine what your support would mean to these men. This entry was posted in Veteran Articles.